With stirring commentaries like this one, reporter Eric Johnson’s video essay “Seattle is Dying” has chalked up more than 1.4 million views on YouTube since it first aired a few weeks ago. Say what you want about this polarizing KOMO-TV documentary, but there’s no denying that it has hit the city like a punch to the gut. 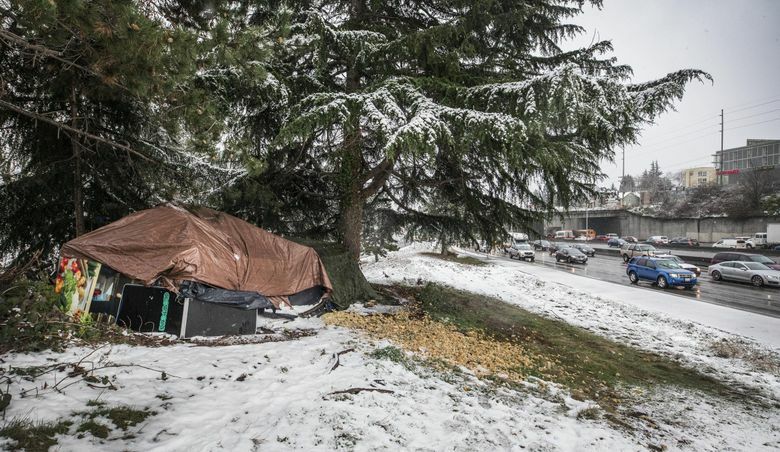 With its ominous music and jarring depictions of garbage-strewn tent encampments, people living out of beat-up RVs, mentally ill people floundering on street corners, open drug use and public disorder, it makes the case that Seattle’s brand of compassionate altruism is no match for the crisis happening on our streets. “How did the word ‘compassion’ get twisted into this sickening reality?” Johnson, who narrates the film, wonders. So while I’m inclined as a journalist to come down hard on Johnson for his graphic and at times misleading imagery, alarmist tone and scapegoating of people living on the margins of a city that’s busy enjoying a gilded age, the fact is I see some of those same realities play out in the downtown area every single day. I’m also sickened by the sight of people sleeping in tents and behind cardboard, human waste and piles of discarded clothing and donated food left on sidewalks, people shouting in the street to listeners real and imagined, and young men shooting up in plain view and sprawled out barely conscious. I, too, feel at a loss for how best to advocate for people who say hello to me from doorways and patches of pavement that double as home. And I’m just as angry as some of you with our city, county and corporate leaders for what seems to me to be a tepid, plodding and disconnected response to a homelessness problem that they themselves have told us is an emergency. But it’s not our compassion that’s gotten twisted. I’d argue that compassion is our saving grace at a time of such profound transformation and disruption that it’s possible to capture tents and luxury apartments in the same frame. Compassion drives the work of countless grass-roots organizations whose mission is to provide shelter, food, clothing, safety and a path forward for our community’s homeless and afflicted. Compassion has prompted well-meaning advocates to push for safe-injection sites and needle-exchange programs. Compassion compels one man I met while reporting the 2017 project “Portraits of Homelessness” to personally pay for garbage bags, rakes and portable toilets for tent campers near his home by the I-90 interchange. I often fret, as Johnson does in the film, that the millions of dollars we’ve dedicated to fighting homelessness have been poorly spent. The crisis seems worse today than ever. But the barriers to sustainable living in this city seem higher than at any point since I started reporting in Seattle nearly 25 years ago. Let’s not forget the context in which we’re battling it out over what to do about homelessness — and public drug use. Let’s remember that at the same time we’ve seen a proliferation of tents and RVs and people getting their fix out in full view, we’ve seen an explosion of wealth and gentrification in lower-income and majority-minority neighborhoods. “Seattle is Dying” isn’t much interested in the gaping chasm between rich and poor in this city, or the extent to which socioeconomic factors, such as cost of living, family estrangement, personal financial crisis, lack of access to mental health care, housing displacement and a persistent shortfall of affordable housing contribute to the most visible and disturbing aspects of street life. The film rightly points to the need for alternatives to addressing debilitating substance use, in particular of heroin, among the homeless. It’s a huge problem and there’s no sense in denying that drug dependency has exacerbated some of the spinoff issues associated with homelessness, such as thefts and lost business due to disorderly behavior. Still, we live in a city where even people who have stable work and adequate shelter, and who are not bogged down by drug or other problems, struggle to find housing and community. I’ve felt this love/hate ambivalence over what Seattle’s becoming myself. Our crisis is much bigger and more corrosive than what’s described in the documentary, but none of these problems has to be the death of us. I like that Johnson wants to prod our often self-satisfied city into new ways of thinking about how we help the most beleaguered and vulnerable — and how we maintain public safety for everyone. The problem is he’s striking the wrong chords. History will judge us by our willingness to view our most fragile neighbors as equals — and not just as a blight on our glory, a problem that needs fixing or a population that needs removing so we never come face-to-face with the struggles of those who don’t have the same options that we enjoy. This “jewel” of a city isn’t dying because people living in the streets are ruining it for the rest of us, as this documentary dramatically contends. But they — and we — can live a lot better than this.